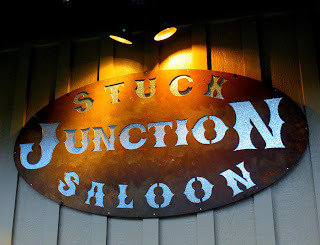 The name Stuck Junction, the original name of the village that would become Sumner, the use of "saloon," and the signage all hint at an old west theme, but the vibe of the place is more of a typical suburban sports bar or something more akin to an Applebees. They made a pretty good mohito, and have a sizable menu of contemporary American pub food. The location has a fairly long history of bars, with the Mint Club here in the 40s, the Turf Tavern in the 50s through the 70s, Sharkey's from the 80s into the 2000s, then briefly The Silo and then Bottomz Up, before becoming Stuck Junction in March of 2014.